Lack of a cohesive product design is the quickest killer of a software project. If you have an idea, you need a design assessment before you ever write your first line of code. And here’s why. 0) What is a design assessment? A design assessment is a 3-4 week pre-development process that gives perspective to an entrepreneur’s idea prior to building software. This process focuses on understanding the goal/vision and working towards being able to show it through a prototype. Often an entire project is too detailed for this short of a timeframe, so we focus on key user-flows. Identify several key features users need, and work towards flushing those out. One of our most successful assessments was for GWIG – Go Where I GO. 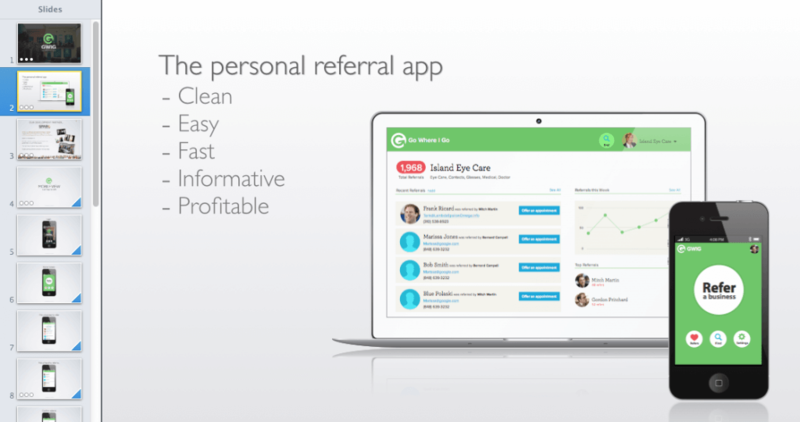 GIWG is a product that allows a user to recommend a business to a friend. During the assessment, I filled the early roles of Strategy & UX, with our commercial services Director acting as PM & light requirements. Later into the assessment, we scaled the team with another designer, Matt Brooks, who invested in the idea and began taking the early user flows and adding visual design detail to them. One simple strategy when working with a new client – keep the assessment fun & make the process painless for them. During GWIG, we added characters from the movie old school to the prototype. Having Gordon Pritchard tell the story was a lot more interesting than a John Doe. And as designers, a good sense of humor was a great motivator. We’ve done dozen’s of assessments this past year. Each assessment has a different goal the client is looking to achieve. For a entrepreneur with an early stage idea looking to raise capital, we often deliver the assessment as a pitch deck for them. For an established product looking to re-design, we deliver detailed requirements & design comps at the results. For a client looking to go straight to development, we create a clickable prototype in HTML. By using production-ready front-end code, the prototype is also first step of development. In each scenario, the results are tailored to match the clients needs. When we pitch clients a design assessment rather than jumping straight into building a product, we occasionally get some confusion of if this is an extra step. Our response is: you’d have to do this anyways. A design and requirements session is required before you can get started building software. It’s part of the process. The only difference with an assessment is we’re compartmentalizing these elements before jumping into a development cycle. It’s expensive to have a development team sitting around waiting for work, it’s even more expensive to have developers building the wrong thing. With a design assessment, you’re only paying for the part of the process you need now. All of the work is transferable to the next phases of the project. When Charlie from GIWG first approached us, he had a napkin sketch of a logo and an idea. He left a lot of room for us as designers to listen to his goal, and design the user experience around those goals. He also appreciated our take on simplicity in the UX. Once we moved past wireframes and began layering on elements of visual design, he was able to begin seeing his vision come to life. It’s incredible what a good collaboration of vision & design can produce. Most entrepreneurs test there idea by discussing with others. There are many components of a solid business plan, but being able to see the final product flushed out is the strongest litmus test. Nothing elicits feedback like being able to see yourself using the finished product. Design assessments are never meant to be the finished product. Through discussing with others, or living with the prototype for a short time, you’ll see it’s strengths and weaknesses. The design decisions you arrive at during the assessment are not meant to be final, so don’t treat them as such. They’re simply the first iteration – a first testable version of your product that you can learn from and improve upon. In the 12+ assessments we’ve done, we’ve never gone straight to code with a finished design. We’ve continued to iterate & improve on the original design. It’s this cycle of learning & improving that creates a successful user experience & well designed product. Using the design assessment process to visualize that idea brings the short-term results of being able to visualize the idea, build a relationship, and test that idea. And the long-term result is better quality software and an easier development process.